VTV.vn - At a meeting in Hanoi on January 14, National Assembly Chairwoman Nguyen Thi Kim Ngan talked about how safeguarding the sovereignty, territorial integrity, and security of the country's border and sea areas is a strategic task that requires the involvement of all individuals and the entire political system. 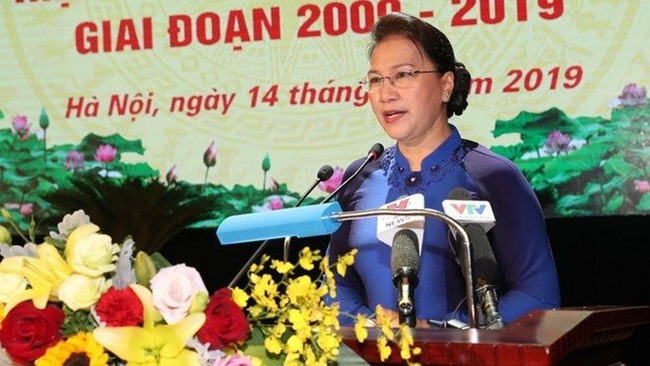 The event, held by the Ministry of National Defence and the Vietnam Fatherland Front Central Committee (VFFCC), reviewed the implementation of the “All People’s Border Defence Day” during the 2009-2019 period. Ngan emphasized that the national border and territory are sacred and inviolable. Organizing the “All People’s Border Defence Day” has been effective in demonstrating the Party and State’s profound focus on building, managing, and safeguarding Vietnam's national sovereignty and border security.